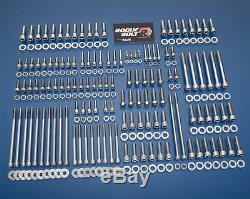 LS1 STAINLESS STEEL ENGINE BOLT KIT. Fits GM LS1 & LS6 3-Bolt Throttle By Cable Applications We have LS1 LS6 Drive by Wire, LS2, LS3, LS7, and Vortec 4.8 5.3 6.0 6.2L Kits Available! We have LS1/LS6 drive by wire, LS2, LS3, LS7, and Vortec kits available for the same price! This kit includes most external engine fasteners with the exception of the accessory bolts. If you are planning an engine swap and need a few bolts, or just want to add a touch of class to your LS motor, then give some serious consideration to our stainless steel allen head bolt kit. You will not find a higher quality allen or hex head kit anywhere near this price! Note: We HIGHLY recommend a 3/8 drive allen socket set which can be found at your local Sears, Home Depot, or even Walmart. We stress the details so you don't have to! It's more than just the fasteners. We are born and bred car, truck, and jeep enthusiasts! We know that you likely have installed aftermarket headers, valve covers, etc. And the varying flange thicknesses require different specs than OEM fasteners. We put together solutions that not only work well for stock applications, but also have your modifications in mind. For your convenience, each kit comes professionally packaged in individually labelled bags with recommended torque specs right on the packaging! This kit includes fasteners for the following: Coil Pack / Brackets Fuel Rails Headers Intake Manifold Mass Airflow Sensor Oil Pan Rear Engine Cover Throttle Body to Intake (3-bolt) TPS & IAC Sensors Throttle Cable Bracket Timing Cover Valley Cover (Button Head for use with OEM & FAST Intakes) Valve Covers Water Pump Water Crossovers NOTE: If you have a 1998, please let us know so we can supply the correct valve cover bolts! It wasn't by chance that we came to be. It was the poor experience of using black oxide fasteners from the likes of ARP and others that we realized there was a real need for reasonably priced, quality fasteners that won't rust! Stainless steel is an obvious choice for most external engine fasteners as it not only looks great and requires no maintenance, it is corrosion resistant and typically will not rust! Polished stainless steel is like polished aluminum minus the maintenance! Our allen head bolts are much shinier than most stainless steel hex head bolts you will find. Comparing one of our allen head bolt kits to a non-polished hex head bolt kit is like comparing a new shiny paint job to a weathered 30 year old paint job. In addition, allen style bolts offer a smaller diameter head for greater clearance around the bolt head. Some aftermarket headers require smaller diameter heads or the bolt head will actually hit the header tube! It is also much easier to get a 5/16" allen wrench or allen socket on a bolt than a 9/16" socket or wrench! Another big advantage of allen-head bolts is the socket head, which will not round off like hex head bolts. Rusty, rounded-off bolts is a thing of the past! We take pride in offering savvy solutions to all of your fastener needs. Whether you need an off the shelf engine kit or would like to tailor a custom kit for your specific needs, we offer the flexibility and timely service to get you taken care of. All of our products are professionally packaged here in the USA, creating jobs for American families. We appreciate the opportunity to earn your business! The item "LS1 STAINLESS STEEL ENGINE BOLT KIT CAMARO CORVETTE LSX LS2 LS3 LS6 LS7 INTAKE" is in sale since Tuesday, January 20, 2015. This item is in the category "eBay Motors\Parts & Accessories\Car & Truck Parts\Engines & Components\Engine Rebuilding Kits". The seller is "rogue_bolt" and is located in Gilbert, Arizona.